If you're going to spend money on a bass guitar part, be sure you get the BEST! Bill Watson's bass guitar playing has been a part of the Play It Again Demos and Nashville Trax sound for seventeen years now! Best known for his work in the country, Christian, rock, and blues genres, he has played on over 1,000 client demo, master and album projects. At this writing, songs he's played bass on are in rotation on radio stations in the U.K. Australia, Canada and the U.S.A..
His work on 34 songs for Nashville Trax client Wayne Patterson helped Wayne's gospel trio win "Song of the Year" and "Album of the Year" at the national NCMAI competition in Pigeon Forge, TN (March 13th, 2016).The trio performs live to recordings made at Nashville Trax. Watson's work also helped Wayne's trio sign a deal with Big Noise. The head of Big Noise, Al Gomes, has produced Christina Aguillera, J. Geils Band, Red Hot Chili Peppers and other well-credentialed acts. In May of 2016, "He Will Set You Free" by Nashville Trax client Mike Anderson with Watson on bass, Tom Wild on guitar and Jenee Fleenor on fiddle, mando and bgv's reached #9 on the U.S, National Bluegrass charts. Want results? 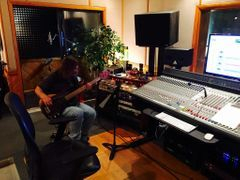 Doesn't it make sense tot hire the driving force behind other successful recording projects for your bass guitar work? "Something Unforgettable" is © 2017 Joe Finley, published by Listen Again Music (BMI) Unauthorized use is a violation of U.S. and International Copyright law. Nashville Trax musicians: Jim Riley (Rascal Flatts) on drums; Jenee Fleenor (Blake Shelton, Martina McBride, Steven Tyler/reigning CMA Touring Musician of the Year) fiddle and mandolin; Nashville session guitarist, Brent Mason; and Steve King (Keith Urban) on piano and B3 organ; Bill Watson, bass guitar. "A Day Without Progress" © 2016 Dan Thompson. Unauthorized use is a violation of U.S. and International Copyright law. Sundowner is © 2015 Bill Watson. Unauthorized use is a violation of U.S. and International Copyright law. The above bass tracks were played by Bill Watson. Other Nashville based session quality bassists are available including Randy Smith, Dow Tomlin, Duncan Mullins and Mike Wolofsky each of whom brings a different sound and skill set to the table. You can choose the player you prefer or order and we'll assign the correct player for your song. Got the bass tracks this morning and imported into PT. Why order from us? We have proven pro quality session players, playing on a professional quality instrument through quality gear. Bass guitar players around the country offer tracks over the Internet. But they will likely not be professional session musicians. They won't likely have multiple bass guitars on hand designed for recording. And they won't have the expensive pre-amps, processors and a commercial grade mixing board designed to enhance the sound. We create punchy, clean sounding bass guitar tracks played tight-to-the-click with energy and focus. Along with drums bass guitar is the foundation of an excellent project..
Why settle for a semi-pro playing through semi-pro recording setups? "Bill, I've played with Elton John's bass player Dee Murray and other bassists of his caliber, your playing is right up there with them, "in the pocket" and great note selection, love playing with you brother!" Nashville Trax session drummer, Greg Ewen. "Thanks Bill! The bass guitar track is absolutely perfect, couldn't be better!! Thanks so much"- Danny McBrennan, Ireland. "Bill, your bass track on Grace's original made the song! "- Brian Kelly. Brian is referring to his New Zealander daughter, Grace Kelly's session May, 2016. IT'S SO EZ to add a bass guitar track, played by a Nashville professional session quality player, to your home or studio recording project, right over the Internet! Any style of music can be accommodated, these guys can play anything! Step 1: Send your rough mix .wav via Dropbox.com or Hightail OR send an mp3 stereo mix of your project to nashtrax@bellsouth.net along with any notes. 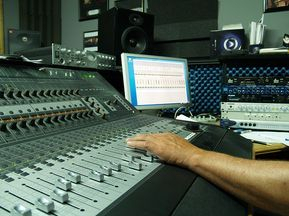 either as a separate track, or panned hard left and the rest of your mix panned hard right so we can adjust the click volume.Yes, no problem, we can work without the click but it will be easier and usually somewhat tighter with, provided your other instruments lock to it also. A vocal, low in the rough mix, just enough to be audible is extremely helpful as well. For $95 you'll receive one bass guitar part. Two songs, both needing bass? Only $170.